Separation, in the well known sense of sorting the wheat from the chaff. We all reached those 2000 years prophesied times. Those growing in their awareness of Truth, and reaching the necessary high level of consciousness, are entering their Ascension. This process of transcending from 3rd to 5th Dimension is also called “The Harvest”. The statement shows more than clear that all preparations are finished. Just as resolute, this statement confirms that the Ascension is already enacted. Higher Light is the Purity of Light of the new, higher dimension. 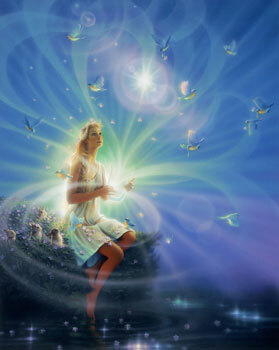 Gaia herself, who ascends with her humans, as well as all ascendants, are given a compassionate strength and guidance by very many Masters and Angels and loving space brothers and sisters. Again a most wonderful statement, that our Era of Light has begun.